Oh the manic life I lead. A writers life is one of fits and starts… drudgery and exhilaration. After approximately one and a half years I get to rest my weary head and scream for a day or two now that my newest book is out the door. For my friends who have followed my progress since the project began I give you the first page of the final manuscript… just hours before it becomes available to the general public. Thanks for all your support. 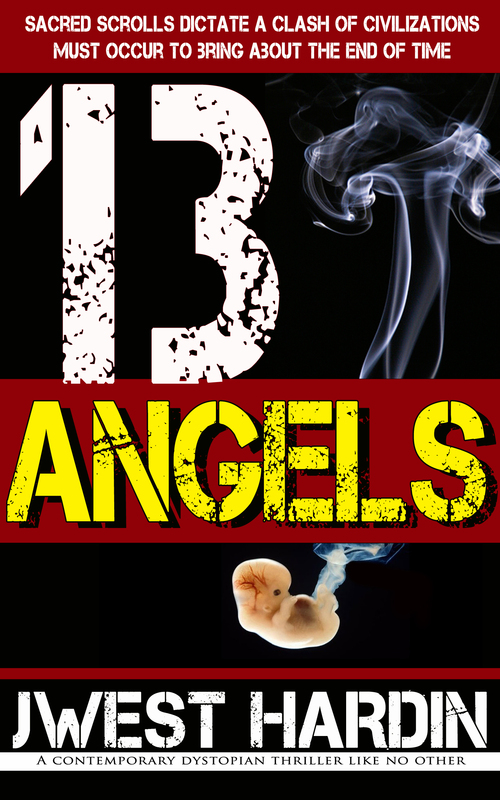 Thirteen Angels will be available on Kindle, Amazon, Barnes and Noble, Sony, Kobo ( and others- distributed internationally at $2.99 usd) as an eBook. Hard Copy will become available soon for collectors. Tangled lightning lashed Castle D’Arc. Its crenulated silhouette outlined a gap-toothed scream against every explosive crack of fire. Each quick following barrage of thunder suggested Armageddon. The embattled redoubt fought raging tides threatening to rip out foundation stones and cast them into the greedy maw of an encircling leviathan. Two cassock-draped figures strode desolate battlements, unrecognizable under long woolen hoods. The cloth was stretched into shapeless socks, a vain attempt to thwart the stinging slap of freezing rain. “Damn this weather”, snarled the smaller man. His teeth flashed white. No matter which way he turned, an icy wind stabbed at his eyes, blinding him, as if the world vengefully denied him sight of it. Another splinter of ragged lightning shred the gloom, exposing his upturned face, a mask of angry vexation. “This is how I imagine hell”. He beat his skeletal hands and stamped like an impatient stallion. “It is a hell of your own creation brother”. A familiar voice subtly reminded Azazel they stood on hallowed ground. Conscious-stricken, he choked back his irreverence and offered up a prayer of contrition. The rueful monk hoped his deity would understand a loyal servant’s frustration after a lifetime of disappointment. “Oh lord”, he begged, “Have mercy”. He bowed his painfully stiff back into the attitude of a grateful supplicant and whispered, “If you look down upon me you will see I have been the victim of the constant and unremitting malice of fortune”. His need for penance sated, the monk resumed his march. “Where is it?” He returned to ranging the impenetrable night with bursts of psychic energy. Azazel shook his fists in the face of the wind like a combatant avowed to fight on in defeat. He prayed the coven’s collective will was strong enough to turn back this storm. It felt certain nature’s wrath was set deliberately against them. “It’s just a storm”, the same voice chastised. “Remember where you are”. Azazel kept his lips closed with the expression of a man inwardly laughing that he would be the one to welcome the Holy Arc and resurrect the Eye of Ba’al. Destiny chose him to lead this cycle. He hoped it was the final step towards ending his miserable life. “I don’t see you out here” he shot back contemptuously. His obdurate prayers had been stripped naked by the tempest.